Girls Skate Jam at The Works Skatepark THIS MONDAY! 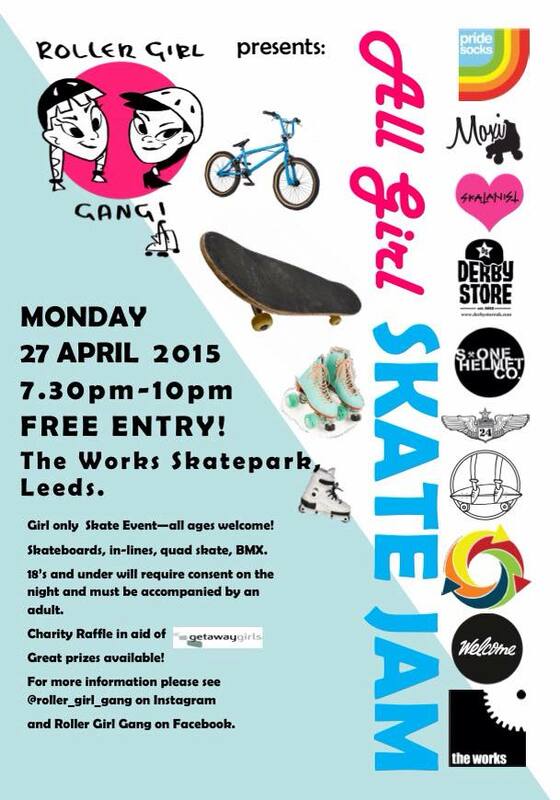 The Roller Girl Gang have set up a girls jam at The Works Skatepark in Leeds THIS MONDAY 27th April! It is a girls only event, but open to all sports: Skateboards, Inlines, Quads, BMX etc – All ages and abilities welcome too! Don’t forget to bring along a bit of cash for the charity raffle that is in aid of Getaway Girls, an organisation for vulnerable young women in Leeds. With loads of great prizes up for grabs, sponsors include Thrasher Magazine, Krooked Skateboards, Thrashion, S1 Helmets, Pride Socks, The Derby Store and loads more, (including some Girl Skate UK tees!) plus FREE entry to the jam – there is no excuse not to come and get involved! Check out more information on the Facebook Event Page! **Those 18 and under will require a parent or guardian to sign a consent form on the night and must be accompanied by an adult. ← Unit3Sixty Girls Night THIS WEDNESDAY in Stourbridge!